Guitar Bodies | Gun Stocks | Musical Instruments | Propellers | Furniture Components.. 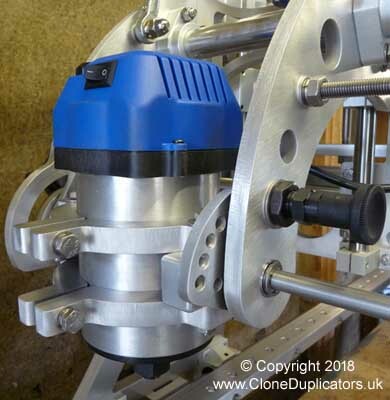 The Clone 3D & 4D can accommodate 88.9mm ( 3.5″ ) and 106.7mm ( 4.2″ ) diameter round bodied routers. Clone do not directly supply routers. Clone do not directly supply cutters. All fully built Clone duplicators come with one 14.7″ (+1mm) round nose stylus tip. Additional stylus tips are made to order to customers requirements. All tips come attached to a machined stainless steel round bar. When ordering additional stylus tips please send dimensions of the cutter you would like the stylus tip pairing with and specify whether you require the tip to be ‘like for like’, +1mm diameter, +2mm diameter etc. Round nose or flat bottom cutters? Round nose stylus tips move over the master easier, and the cutters tend not to lift the wood when cutting quite as much as flat bottom cutters. ‘Like for like’ flat bottom cutters are recommended when carving cut outs, channels etc.